We offer insights into music and musicians with our “Opening Notes” 45 minutes prior to each subscription concert in the Turner Studio Theater of the Clark State Performing Arts Center. Pre-concert talks before MasterWorks and NightLights programs cover aspects of the music on the program, and are presented by annual favorites Trudy Faber, Maestro Peter Stafford Wilson, composers whose works are being performed, and others. Every year, 1,500 area students attend an SSO concert at the Kuss Auditorium of the Clark State Performing Arts Center. The students are treated to an orchestral concert experience, the goal of which is to excite them about symphonic music, and perhaps inspire them to want to learn to play a musical instrument. We continue to hear from adults of all ages who were inspired by these concerts as children. It is a memorable experience and still a highlight of their lives even decades after the event. Starting in 2016-2017, the Springfield Symphony Orchestra has joined almost 100 orchestras all over the world in offering Link Up, a program designed by Carnegie Hall’s Weill Music Institute. Link Up is a program that integrates with music classrooms and brings students to the Kuss Auditorium ready to sing, dance, and play recorders along with the SSO from their seats. Sponsored by the Ruth B. and Thomas F. Mackey Charitable Trust, Dennis and Margaret Roark, and Security National Bank. This special program is made available through generous donations from Lawrence Landess and Mark Grimes. During each concert season, 20 students from Perrin Woods and Lincoln Elementary schools attend each concert with Music Teacher and Choir Director Sharon Safley. This program brings young people to the concert hall and enables them to broaden their appreciation of all types of music. Special activities include meeting guest artists and SSO musicians, and a backstage tour. Sponsored by Mark Grimes and the Wilson Sheehan Foundation. 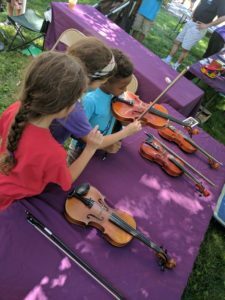 The SSO participates in numerous community events, featuring various performing groups and providing our much-sought-after “Instrument Petting Zoo,” which enables children (and adults too!) to try out different musical instruments with the assistance of SSO musicians. We have held petting zoos as a part of the Springfield Arts Council’s annual KidsFest, in conjunction with the Clark County Public Library, and more! 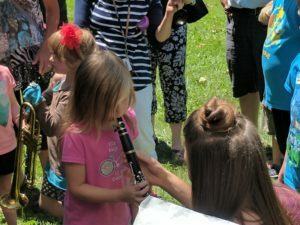 These events offer potential young musicians the opportunity to feel what it is like to touch, hold, and play an instrument. No one is too young or too old to experience the joy of making a sound on a musical instrument! Instruments for our Petting Zoos are generously provided by Kincaid’s Is Music. The SSO partners with many local groups and organizations to bring music and education programs to existing events. Each year, the National Trail Parks and Recreation District holds a Performing Arts Camp in August. For this event, we bring in an instrument petting zoo, demonstrations by professional SSO musicians, a class taught by Children’s Chorus conductor Jennifer Wightman, and a performance at the camp’s concert. Click on the logo to see the SSO on YouTube during one our Concerts for Young People. Click here to download our Students at the Symphony Curriculum Guide, a wonderful way to introduce your child to attending a Springfield Symphony Orchestra concert!! Students enjoy trying out instruments during the Springfield Arts Council's KidsFest. Happiness for these school kids is a visit to the Symphony. Instrument Petting Zoos provide great opportunities for peer-to-peer guidance, as we often bring members of our youth orchestras to help!